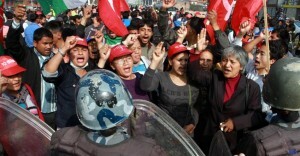 Earlier this month, millions of Nepal’s workers poured into the streets as they conducted a nationwide general strike. A powerful earthquake struck the impoverished country of Nepal on April 25. The original quake measured 7.8 on the Richter scale, with strong aftershocks measuring up to 6.7 causing further damage and injuries. As of April 27, the death toll has passed 3,800. Thousands more are injured, with millions of people forced to live outside without shelter in freezing temperatures. The U.S. has pledged a paltry $1 million in assistance to a country of 30 million people. Outside of the capital, particularly near the epicenter of the quake west of the capital, communities have been cut off from communication by landslides. Their fate remains largely unknown. One village of 3,000 people in the Gorkha district managed to report that every house was destroyed. Helicopter rescue operations have begun, but they are devoted to removing the foreign tourists from Mount Everest, where they had gathered for the mountain climbing season. The villages in the countryside, where most of Nepal’s people live, have so far been left on their own. Nepal is one of the poorest countries on the planet. The literacy rate is around 72 percent for men and only 45 percent for women. Health care falls far short of the people’s needs. Sixty percent of births are unattended by any medical professionals, causing many maternal and infant deaths as well as other severe complications. Close to 30 percent of Nepal’s children less than five years old are malnourished. This catastrophe will only worsen the desperate plight of Nepal’s people. 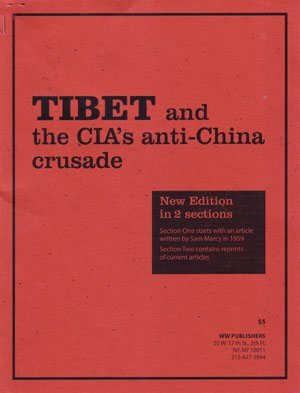 It took a decades-long struggle led by Maoist Communist parties to finally force the removal of the U.S.- and British-backed absolute monarchy in 2008 and establish parliamentary rule. Some 17,000 people lost their lives in these struggles. But despite the strong organization of these parties in Nepal, the country itself remains bitterly divided and still under the grip of multinational corporations. 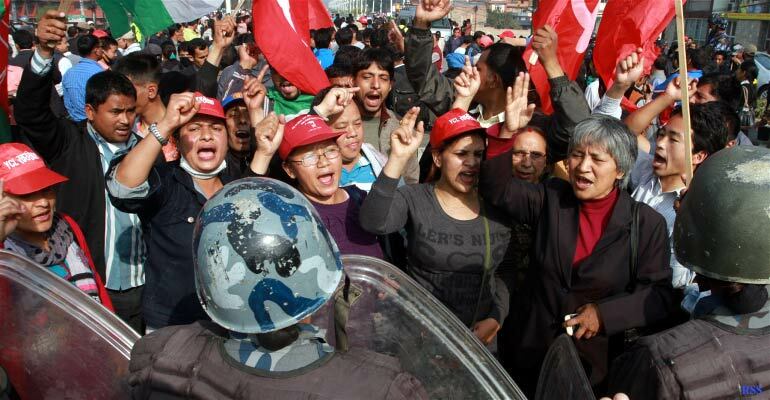 Earlier this month, millions of Nepal’s workers poured into the streets, many waving flags with hammers and sickles, as they conducted a nationwide general strike. They had called this strike to promote constitutional changes that would give more rights to ethnic minorities living in the various regions of the country. This terrible crisis in Nepal calls for solidarity from workers’ organizations all over the world. U.S. and Western imperialism, which have long profited from the superexploitation of that country, have the responsibility of immediately providing all necessary emergency assistance to Nepal’s people with no strings attached.